This car has been featured in Newspapers, The Sebring Program, has been seen on TV on the news, and has had many, many pictures taken of it at the races and is in people's photo albums from as far away as Japan!-Thanks to Mr. Wheat for allowing us to use these pics! To see his site, please go to Team Eldomeano's Homepage. 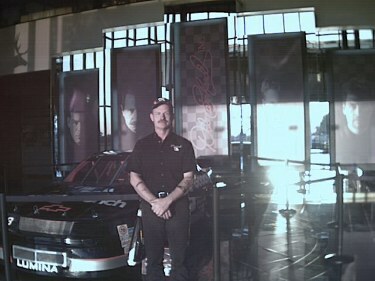 Here is a pic of me in the lobby of DEI. I spent two hours there today just looking at the displays and roaming arount the store. It is an awesome place with lots of memories. This is a true story that happened to me at the Richmond spring race of May 2000. We had pit passes to go into the pits and basically go anywhere we wanted. I bought a program at the track and had a Sharpie with and planned to use it for autographs. For those of you who haven't experienced seeing and meeting a Winston Cup or Busch driver, they are true athletes and professionals. 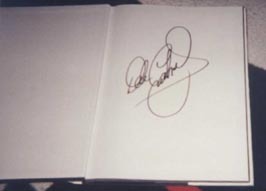 I had collected quite a few autographs that day and one of the last ones was Dale Earnhardt. Dale had just left his transporter as my dad and his two brothers were with me walking around before Cup practice. My dad said, "Look, theres Dale!" I turned around and there he was, the man in black. Dale didn't have a hat on but he had his trademark sunglasses along with his driver uniform on. I walked closer to Dale and asked for his autograph. Dale replied, "No, I gotta go to practice now." However, I didn't lose hope on this. I knew that Dale would sign my program sooner or later. Turns out that a local TV camera appeared in front of him. I was walking behind Dale and he extended his left hand behind his back as he was waiting to sign my program. Dale looked at it, trying to find a place to sign then signed it. This is one thing I'll never forget in my life. I thought I'd share it with you all on here. I can't think of another person's death that hit me so hard. Nascar will never be the same. It was July 15, 1999 about 8:00 in the evening the telephone rings. It was my brother Chuck. He had some news that would change my life forever. He asked me what I was doing next Friday, July 23. I told him that I was off work that day and I was going to take my daughter bowling. We did not go bowling that day. Chuck then went on to read the letter that was sent to him that would change my life forever. "CONGRATULATIONS" You and a guest just won an evening with Eanhardt. We were just one of 50 winners in the State of Pennsylvania to receive an invitation to meet and greet Dale. This was a contest by Coca-Cola. Chuck's wife Cindy filled out the entries and put in the box at a local supermarket. She must have filled the box with the entries. She let me go with my brother. Because of her, I got to meet my hero. I love her. She is the best. 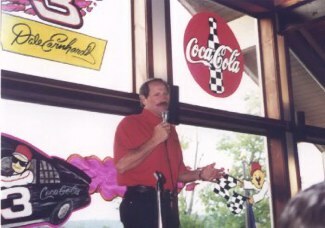 Coca-Cola took us to the Camel Beach Water Park in Pocono, PA by bus to meet Dale. I met alot of Dale Fans. On the bus, we watched the 1998 Daytona 500 win. I had never been to a race yet. We had plans to go to Dover in Sept., and I was about to meet "The Man." I was so nervous! As we were waiting for Dale to arrive, they had food and drinks there and drawing to win Eanhardt things to keep us entertained until Dale got there. Then it was time to line up for the photo with Dale. 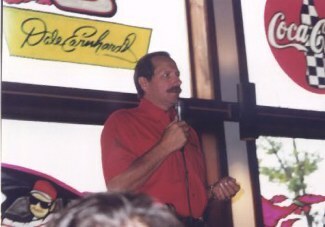 The people who were working there told everybody that Dale couldn't not sign autographs that night because there was not enough time to do that. I took Dale Earnhardt's Determined Book with me anyways. I was just hoping he would sign it. 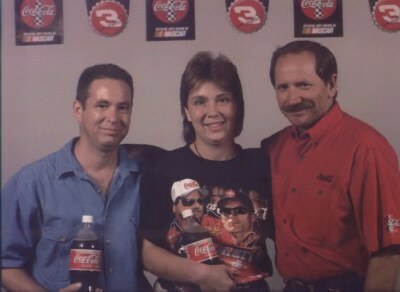 Then it was me and my bother's turn to have our picture taken with Dale. We walked in the room. I was in the same room as Dale! My heart was beating so fast I could hardly breath. There stood my hero! I put my book down on a chair during the photo. In the photo I am standing right beside Dale with my one arm around him. I felt like I was on top of the world! I was with my hero. After the picture was taken, I picked up my book from the chair and wanted so badly to ask him for an autograph, but the words just couldn't come out, but they said he was not signing. Then Dale did something that would change my life forever. He took the book out of my hand and signed it, no questions asked, winked and smiled at me. Now my heard did stop. I was in shock, this was my hero, doing something that he did not have to do. All I could say out of my mouth was "I love you Dale." He smiled again at me. That wink and smile said everything. He made me feel so special. As a kid I was always the last one to get picked on the playground. That night I was first. Dale was such a kind and thoughtful man. He gave me more than just his autograph, he gave me self esteem. I felt so good about myself. After the photos, we had an hour of questions and answers. Dale talked about his family and how much he loved them and how proud he was of Jr. And how he could not wait to race with him. And how much racing meant to him. My brother described Dale as a class act and a true champion. We both became bigger fans of Dale because of that night. He treated his fans so great. He was all smiles that night. Dale acted like one of the guys. I will always miss him. After his death, I did not know if I could ever watch another race. But I thought that would upset him if I quit watching the races. He did not turn his back on me that night, so I can't turn my back on DEI and the sport that he loved so much. That is my story. I never wrote before and I always wanted to share the story. Bottom line: Dale Eanhardt was truly a great person and will always be my hero. He meant so much to me and to alot of people. I am so glad I got to meet him. I wish I had some memories of the REAL Dale. I never got the opportunity to go to a race, my first will be in March to Las Vegas. I have been a Rusty Wallace fan for going on 18 yrs. 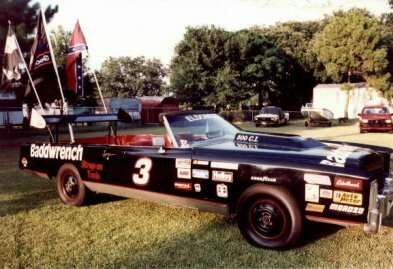 I never knew he and Dale were so close and I used to get SO upset when they would play their "Dogfight" games on the track. Rusty 's car usually ended up as "roadkill. "I would cry for hours at the missed wins and opportunities to win. I just knew he was heartbroken. Only saw him get mad at Dale once and he threw a bottle "to get his attention." I did not know Dale would leave us. If I could turn back the clock for one second I would stop long enough to tell him "I AM SO SORRY." I judged him by the wrong things. I did not know of all his good deeds, hardly anyone did. That is the way that big tough Intimidator wanted it. He had a soft spot in his heart for people - all people- but especially the ones who were struggling or needed a hand up, not a hand out. Dale had more money than God, and made sure he used it to help others. I remember getting so mad I would throw things at the TV when that ominous black car with the #3 would sneak up behind Rusty and play "knock knock. "I would throw the cardboard tubes from toilet paper at the TV (learned really fast that beer cans leave a mark). Then the unthinkable happened. I did not see the 40 car tap him as my eyes were glued to the Blue Miller Lite Ford Taurus #2 sneaking up from behind. I prayed for his safety. "NO" I cried, "Don't go there you know what will happen!!!" As if he heard my cries Rusty halted and stayed between Kenny Schrader in the 36 and Marlin in the 40. Time stood still. Then it happened. I did not think it was that bad of a wreck but my inner feelings told me something truly bad had happened. The tears started to flow. They were still flowing 3 weeks later, and still do when I see anything that reminds me of Dale. I regret I never got to tell him that I too, was a fan. I loved it when Teresa would take his hand and they would walk to the cars. The kisses they exchanged made me melt, I wanted to be loved that much by someone too. I always worried about Rusty getting "hurt" in the crashes with Dale. Now I know part of him died in that car with him and the pain Rusty feels is not one that will ever go away. He thinks about Dale every morning and every night, in his own words at the Awards Banquet. "I was always a Dale fan and did not know it. 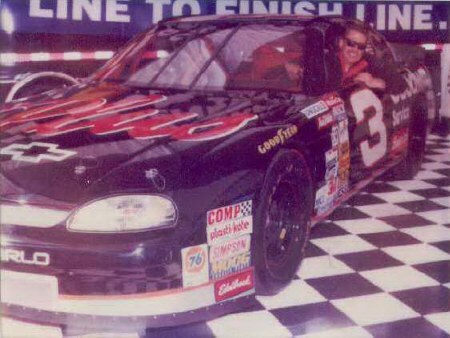 I always loved him and never realized it, or why would I have had my heart broken too when Mike Helton announced those infamous words 'Today, in the last lap of the Daytona 500, we've lost Dale Earnhardt.'" Racing will never be the same, his family will never be the same nor his fans. I will never be the same. I wish I could have told him I loved him. I will make sure that when I meet Rusty those are the first words I utter, even if he thinks I am whacky, I want to let him know. We never got to say "goodbye" to Dale. Maybe that is a sign. Maybe that means he will never really be gone. We all feel his presence at races, his son feels him there guiding him, and I know Teresa can still feel his gentle touch. Rusty can still fondly remember the smell of sardines in his car, a prank by Dale. He will be with us always. I cry each time I read a magazine article about Dale. I thought it would get easier to read about him as time past, but I only miss Dale more and more. I am still looking forward to the new season and will root hard for both Jr., Kevin and all the DEI and RCR teams, but it won't be the same. I just pray for safety. The poem (I wrote) was my attempt to help me and other's that felt the same as I do to be able to deal better with Dale's death and to go on. It makes me feel so proud that you decided to feature it on your site. I only hope Dale Jr. or Teresa would be able to see it and know how I felt about him and his family. This is hard to type as tears are once again coming to my eyes. Thanks again for posting it. The day was February 18, 2001, the day of the greatest NASCAR race of the year. This date is also my daughter's 3rd Birthday. As the day started we knew of the excitement that the day was going to bring with my daughter Haley's Birthday and the start of the NASCAR season with the Daytona 500. 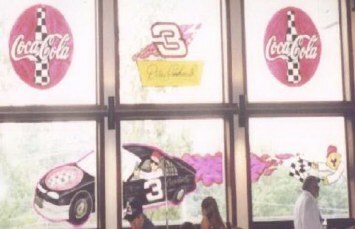 I had the house decorated in both b-day decorations and of course all my Dale Earnhardt stuff proudly displayed, I don't know if I was more excited about Haley's birthday or seeing Dale tearing the Daytona track up. As the time grew closer to the green flag I gathered my wife Staci and daughter Haley to join in on the prayer, the anthem and of course "gentlemen start your engines". My daughter loves to see the cars because we have taken her to other races and monster trucks and my wife is a Dale Jr. fan. Well the race went on and I was glued to the set. As the race came closer to the checkered flag I was asked when we were going to start the b-day celebration for Haley........"as soon as the race is over you have my full attention". There was only a few laps left and I was jumping and yelling because I knew that Dale had a chance for number 2 win at Daytona. As the noise got louder my daughter came in and asked what was I yelling at........."Dale Sr and Jr have a chance to win" so knowing how exited I was she decided to watch the end of the race with me and cheer on both the Dale's. This is when the last lap came around and Dale hit the wall......."daddy, he crashed". As I stared with complete ahw, all I could think of was not again and how was Dale going to feel next Sunday at Rockingham. Well the race was over and there was no report from the announcers on how Dale was and I was really concerned that nothing was said and that the broadcast was over. So I started flipping channels and was on the web looking for updates but there was none. So we were getting things ready for the b-day song and the cake. I said real quick let me check one more time......this is when I seen a sports report on Yahoo that said that Dale was killed at Daytona. I could not believe what I was seeing and I called my wife in to read it back to me to make sure I was seeing it right...........yes was the answer....Dale is dead. I cried like it was my closest relative. My daughter then came into the room and asked me when we were going to do her cake, she was so excited. She seen the tears in my eyes and new that I was sad. This is when the emotional roller coaster started. We went to the living room where the lights were dimmed and the song started. This is the most important day to me and my wife because it took 5 years of surgeries and tests to have my little girl. My wife knowing how much Dale meant to me from all the many years that I have admired him, she came out with a Shamu whale shaped cake with a big number 3 on it for both Haley's b-day and the intimidator. I sang the song with unsteady words and tears flowing. It had to be one of the most emotional things to do as I was filled with joy for my daughter on her b-day and torn because what happened to Dale that day, it was so ironic that I was blowing out a number 3 candle for the last time. My daughter turned to me and asked why I was crying and I told her she was the big 3 and that I also lost a friend. She asked if the friend could be found and I told her only in our hearts and memories. About a week later I had put up all my Dale collection and pictures and as I was doing so my daughter calmly turned to me and said "daddy, you found your friend, he's not lost anymore, he will always be there". I couldn't believe this from a three year old that she could make me feel better that Dale is not lost anymore. I love them both! We continue to support NASCAR and Dale Jr. and I still watch the races religiously now with my daughter, wife and Dale looking over us. God Bless the Earnhardt family and all other fans that have experienced the emotions that I have. One year ago almost that we lost such an icon. I'm so shocked that I'm saying it's been a year already. 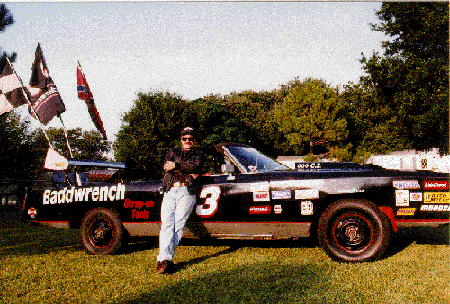 The loss of Dale Earnhardt still sits heavy in most of our hearts, I think it always will. Thanks to a lot of you TeamRacin' folks that were there for me to talk to about Dale and remember him. Several of you feel like family and I so appreciate it, won't ever forget you. We all have to pick up and go on, as hard as it is. Just keep hanging onto the thought that big Dale is watching from above and he's so smilin' to see how much he was loved. Well the picture was taken in Kingport, Tennessee in 1998. I always went to the autograph sessions there at the Food City Family Race Night that they have every year before the race in Bristol. I usualy go with my daughter and my mom and am so busy taking there pictures I never get mine done. 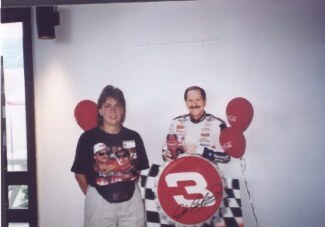 I met Dale Earnhardt at several of those autograph sessions. We'd stand in line for hours and hours no matter what the weather just to get up close to our hero Dale. 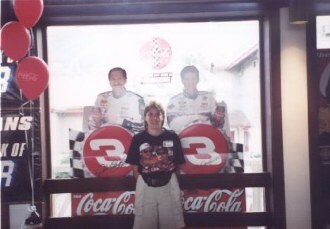 Yes and my mom was in her 80s and went everytime and stood in line with us every time (but she's a Terry Labonte fan) she even got interviewed by the Bristol Newspaper one year while we were in line. Believe it or not if she missed one of those sessions Terry Labonte would surely ask in concern after her as well as the fans who knew her .But as for me meeting the Man in Black, well the firts time I was speechless, second time I almost cried, and this time when my picture was taken I was just as awed by his presence as the last time. As for Dales death affecting me, well it was such a shock that this racing icon could perish in a race at Daytona was unbelievable. But death is a part of life isn't it?? I just cried for weeks and could not get it into my head my hero was gone, still well up with tears at the mention of him, I could have gone to Daytona the following race but know I would have a hard time going there, God bless Dale Jr, he is one of the strongest people I know of, going there and facing that place where such a tradgedy happened. 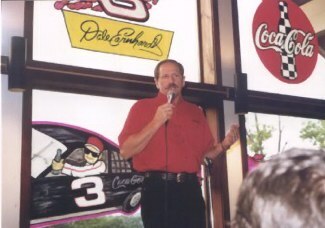 I will always be a Dale Earnhardt fan and will never forget the Man who even made me feel Intimidated even asking for an autograph, but know I will see him again one day when I enter Heaven, and enter the gates to the track where it will be racing as usual and someone will shout" ladies and gentelmen AND Dale Earnhardt start your engines"!!!!!!!!! God bless you all who remain loyal to the sport and may God bless all the drivers.